The average metro train doesn’t go beyond a few stories underground. But sometimes the geology and the geography of the region, such as the presence of rivers and swamps, forces engineers to go deep underground. The Arsenalna, a station on Kiev Metro's Sviatoshynsko-Brovarska Line, is such an exception. Arsenalna’s unusual depth is attributed to Kiev's geography. The station entrance lies at top of a steep valley next to the Dnieper River whose high banks rise above the rest of the city. Arsenalna’s adjacent station, Dnipro, lies just above ground level close to the river bank before the metro line dives into the ground under Dnieper’s high banks. In order to avoid a steep descent, the Arsenalna station had to be built on the same level which required the station’s entrance to be at the top of the banks, more than a hundred meters above. The world’s second deepest metro station is located on Saint Petersburg Metro, which is one of the deepest metro systems in the world and the deepest by the average depth of all the stations. The system's deepest station, Admiralteyskaya, is located 86 meters below ground. The Saint Petersburg Metro including Admiralteyskaya has some of the longest escalators in the world, exceeding 130 meters. 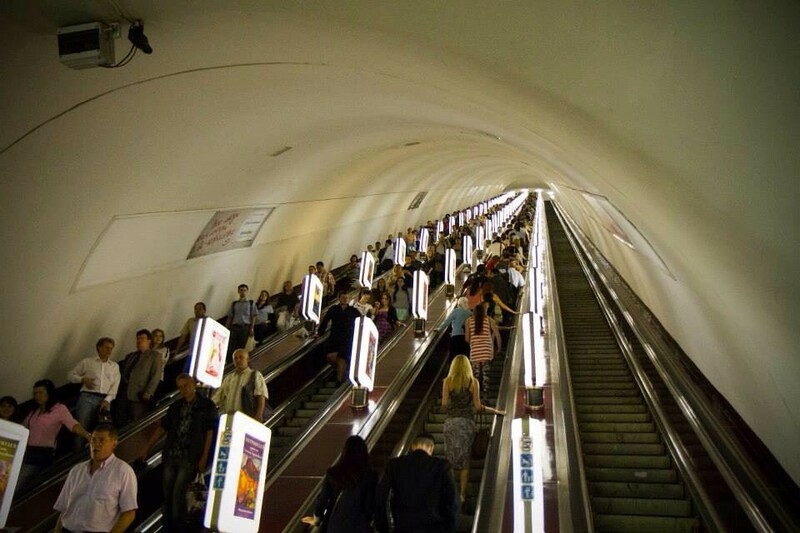 The former Soviet Union has some of the most deepest underground metros in the world. Park Pobedy, located on the Moscow Metro, lies 84 meters underground, warranting it the third position in the ‘list of deepest metro stations in the world’. The Moscow Metro is also the deepest in Russia, having a maximum depth of 97 meters. Like many Russian subway stations, Park Pobedy is beautifully decorated. Yet another contender to the title of the world’s deepest metro system is Pyongyang Metro, in North Korea’s secretive capital city, with tracks lying at over 110 meters underground. Commuters ride down to the Puhŭng Station—one of only two that foreigners are allowed entry— on escalators accompanied by the “sound of revolutionary anthems booming from antique loudspeakers.” The journey takes nearly four minutes. Because of its depth, the metro stations double as bomb shelters, with blast doors in place at hallways. The metro is so deep that the temperature of the platform remains a constant 18°C all year. Washington Park in Portland, Oregon, the United States. Located at 79 meters, it the deepest transit station in North America. Hampstead station, on the London Underground network, located at 58.5 meters below ground level. It is the deepest station of the London Underground. Náměstí Míru, of the Prague Metro, is the deepest metro station of the Czech Republic. It lies 53 meters below surface.